In North Carolina, lawmakers don’t want you carrying a loaded firearm concealed and readily accessible to you. So forget that plan of transporting your gun in the glovebox or console. Those are concealed locations, and both are deemed readily accessible. In North Carolina, you’re technically “legal” by carrying your firearm in a clearly visible location - like on the seat in full view. Of course, this opens up many cans of worms. Others, like thieves, can also see your valuable firearm so now your vehicle is a target. If you get pulled over, the officer doesn’t know your intentions, so you need to figure out how to notify him or her that you’re trying to lawfully transport your gun in full view and not in a concealed manner. 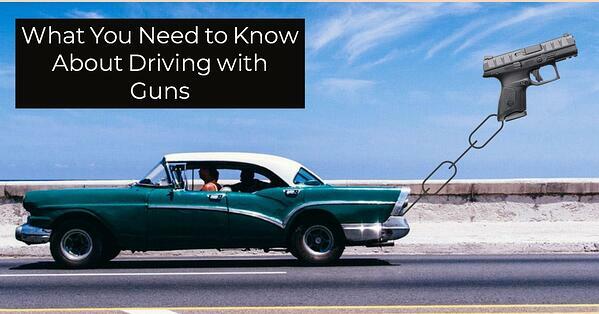 Last, but not least, anytime you hit the brakes, your loaded gun can become a projectile. Since carrying a firearm on your dashboard or seat probably isn’t a great idea, the state provides some options although the law is very unclear on details. You can transport your gun in a glove box or console, provided that it’s locked. That way, it’s no longer easily accessible to you. The trunk is another example of a seemingly workable solution. Things loosen back up as we pass into Virginia. As with South Carolina, it’s OK to transport a firearm in a compartment like a console, glove compartment, or trunk. As long as it’s secured (not necessarily locked) in a compartment, you’re good to go. First of all, we’re talking about passing through without stopping. You cannot have a firearm in your vehicle IN the District of Columbia without a proper permit, so don’t stop. If you’re passing through as we are, you’ll need to follow transport requirements carefully. Your firearm must be separated from ammunition, unloaded, and stored in a location not readily accessible from the passenger compartment, meaning the trunk. If your vehicle is an SUV or one without a trunk, then your firearm must be in a locked container. First of all, it’s illegal to carry any loaded firearm in a vehicle in Maryland, so there’s that. Also, Maryland is notoriously bad about hassling concealed carry permit holders from other states. The Maryland Coordination and Analysis Center receives data from around the country and can sometimes match concealed carry and other lists to your license plate. Be careful and follow the law like a boss because you might be the lucky winner of a random search and seizure stop because you're likely some sort of terrorist. Maryland also prohibits the transportation of handguns in vehicles without a state permit unless the gun is being transported back from the store, from one of your residences to another, to the range, etc. You can’t just drive around with one. If you’re passing through, it must be unloaded and not accessible from the passenger compartment, much like as with Washington, D.C. Since my fictitious trip ends in Maryland, I can’t travel with a handgun at all because I’ll end up in a state that doesn’t allow it. I can, however, travel with a long gun, provided that it’s unloaded and inaccessible as I pass through DC and Maryland. As with other restrictive states and the District of Columbia, federal law as outlined by the Firearms Owners Protection Act offers some protection for travelers passing through more restrictive states. As long as you don’t stop and visit in states like Maryland, you are protected by FOPA provided that your firearm is unloaded and stored in a location not readily accessible from the passenger compartment. Be safe and get a proper locking case. If you’re simply transporting a gun from state A to state B, you can always take the safe approach and unload it, lock it in a case, and bury it in the trunk. That approach keeps you on safe legal ground in most cases. However, if you are bringing a firearm for protection, you need to think through some scenarios. For example, if you happen to get a speeding ticket, you may not want to introduce risk into a simple law enforcement traffic encounter. Where is your insurance card and registration? Is it in the same console or glove box as your firearm? If it will be, think about how you will calmly inform the officer of that fact before you open up and expose a gun by surprise. Better yet, store your paperwork in a different location. I point out these examples to illustrate the range of laws and regulations that might come into play during a simple road trip. Don’t make assumptions that other states operate like yours or that while traveling, you can simply follow the vehicle laws of your home state. Fortunately, there are a couple of web resources that will help you stay informed. Both the NRA Institute for Legislative Action and handgunlaw.us offer useful summaries of state firearms laws and both provide plenty of links to the source material on each state’s website, so it’s (relatively) easy to find what you need. Remember, know before you go. It’s your responsibility.